Yes. I did it! Bungee jumping! The region around Biella, halfway through Milan and Turin and not far from the Alps, is heaven for adventurers and nature lovers. 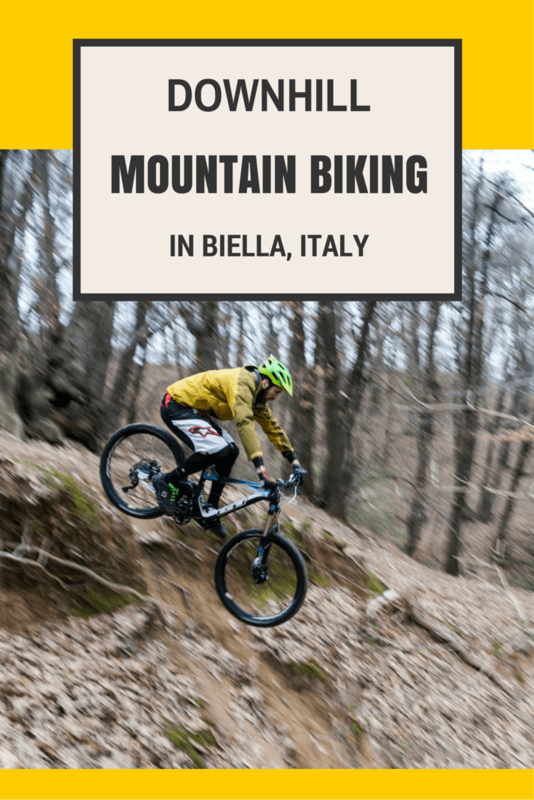 Here’s what we did during a weekend in the region – even though the title gives it away, you already know I ended up in Biella bungee jumping! If you asked me what I knew about Biella before our weekend there, I would have said ‘that’s where Menabrea comes from’. All I knew about this remote, little known corner of Northern Italy was that my favourite beer is brewed in town. And the place is less than an hour away from Milan. I know, it’s bad. Why isn’t Biella better known? 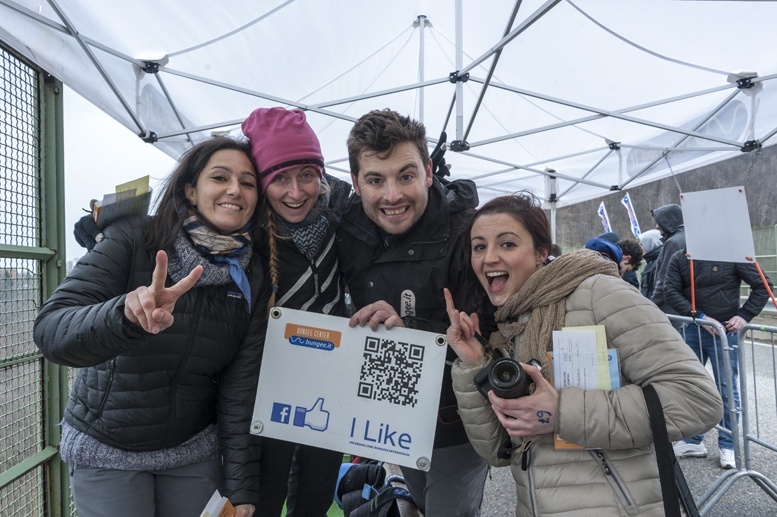 The region has everything it needs to become one of the tourism hotspots of Northern Italy. The Alps are nearby, with stunning hiking paths and some of the best ski resorts in the country. 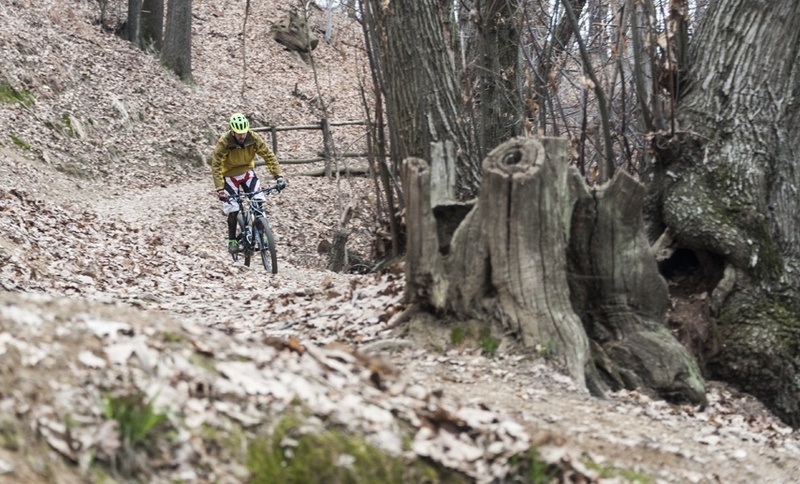 If hiking is not your thing, you can opt for mountain biking; the area offers trails for all levels, from fun family outings to hair-rising options for downhill daredevils. Since the middle ages, Biella has been known in Europe for its textile manufacture (first) and industry (then). The reason is to be found in its geography – the mountainous landscape was perfect for sheep farming, and the abundance and purity of water favoured the construction of textile mills, producing some of the finest fabrics around. Until the 21st century, the textile industry was more than enough to satisfy the region’s needs. From large industries, to small, family operated affairs, pretty much everyone in Biella was employed in the sector. This is why tourism was never a priority. A dozen years or so ago, everything changed. Cheaper competition from abroad destroyed the century-old textile tradition of the area. Only the larger businesses survived. 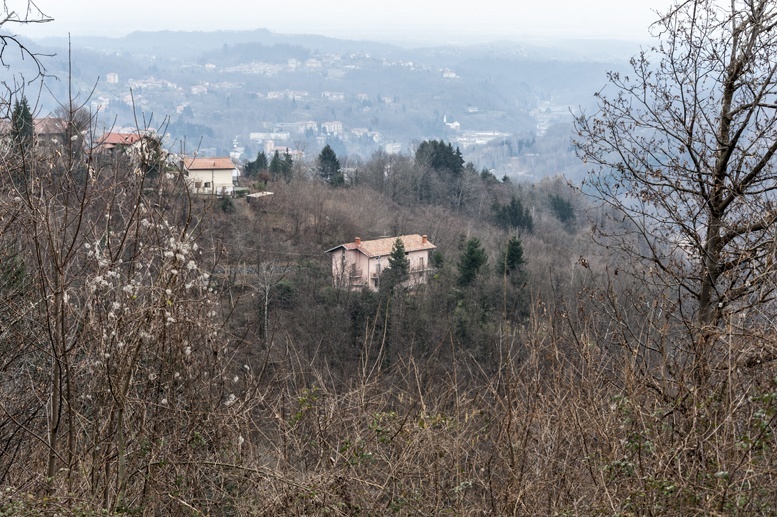 Most small ones had to close down, and the people of the Biella area turned their attention to the wealth they had in their hands – their own territory. The Biella region offers countless opportunities for exploration. 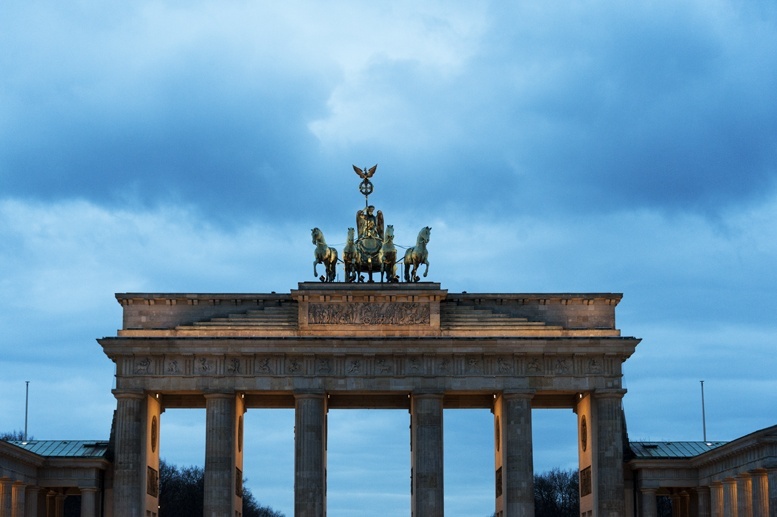 From food and wine tasting, to religious and cultural tourism, and of course, our own favourite: adventure. Hills and mountains, mountains and hills. They’re all around you, as you move across the region. Mountains covered in woods, dusted with snow, overlooking valleys and rivers, with pretty villages below. The area seemed to be made for mountain biking. And when I say mountain biking, I mean serious stuff. I had just spent the previous weekend cycling around Lake Garda – a bucolic, tranquil bike ride. This one in Biella was nothing of the sort. Our guides Ludovico and Fabio, from the local bike rental shop Il Ciclista di Candelo, asked us if we wanted to do ‘a bit of downhill’. Sure, we said – not knowing that our definition of ‘downhill’ was rather different. After a few minutes cycling down a country road, Fabio turned his bike towards something that seemed to be nothing more than a trail across the woods. I barely saw him, as he zipped downhill at light-speed. I was terrified, but slowly at first, and then faster, I gave it a go. Fabio and Ludovico were excellent teachers, showing us the correct way to use the brakes, and explaining that (within reason, of course) speed actually helps control the bike. I found it hard to believe, but with a bit of practice, after a few twists and turns across the forest, I managed to overcome my fear of losing control and just let myself go. Mountain biking is the perfect way to combine nature and adventure. You get to appreciate the landscapes, and enjoy the thrill at the same time. 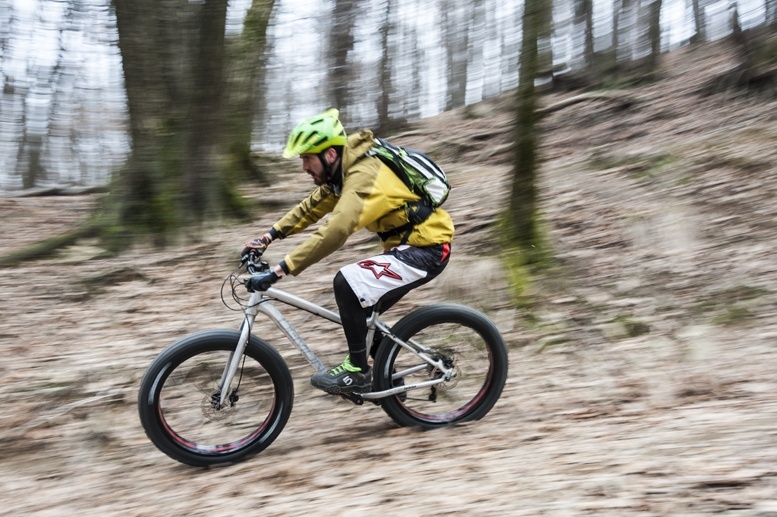 …and with the fat bike! 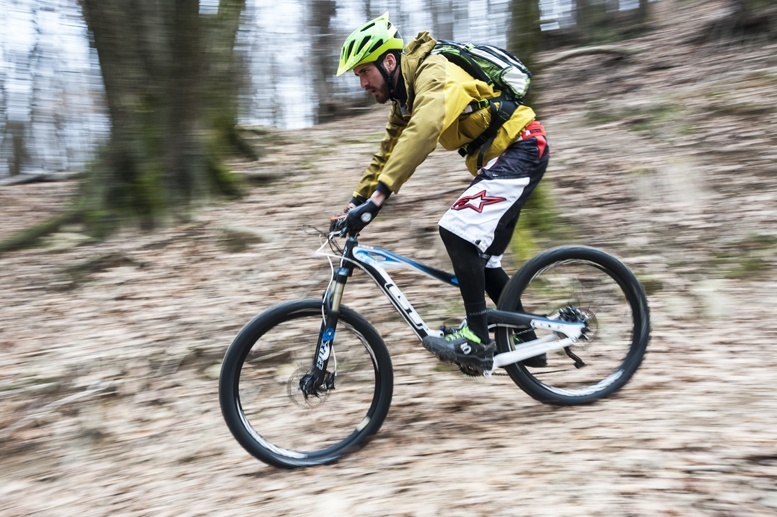 Downhill mountain biking is not for the faint-hearted – it’s incredible fun, but it should only ever be attempted with a guide if you’re not familiar with the area, and with a good, well maintained bike. 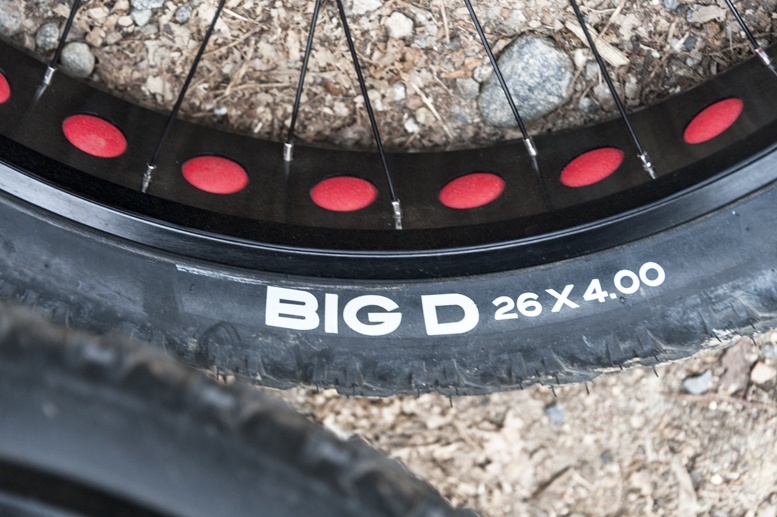 I had a go on a ‘fat bike’, a model with extra-large tires that offers more traction and stability on uneven terrains. Strangely enough, fat bikes are not heavier than regular ones – and I’m not much of a bike connoisseur, but they do feel more stable. Mountain biking was a great introduction to the area, but the big one, the mother of all adventure activities, the reason why we travelled to the area was another one. Bungee jumping. Even saying the word aloud sends chills down my spine. It was, at the same time, the greatest and most terrifying thing I have ever done. 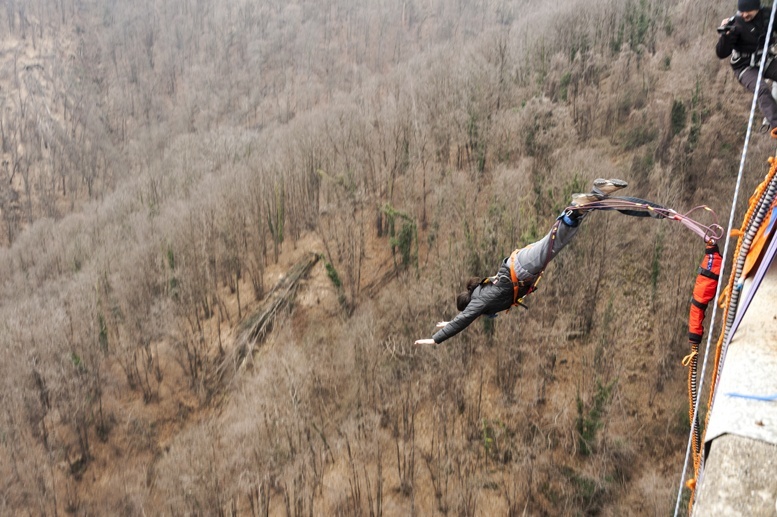 When I agreed to bungee jumping, I didn’t actually realise what I was signing up for. It was one of those things that sounds amazing at first – but as time got closer, I was more and more scared. That the elastic would break. That I would hurt myself. That I would get there, and somehow not be able to do it. Thing is, I’m afraid of the void. To be honest, it’s not fully-fledged ‘fear’, it’s more like a deep sense of discomfort. I’m not comfortable looking down a balcony, a cliff or anything that involves meters of void. So, why did I sign up? To challenge myself. To be able, afterwards, to say ‘I did it’. I took the leap – literally. And what a leap it was. The Pistolesa Bridge (also known as ‘Colossus’, do you get the idea now?) 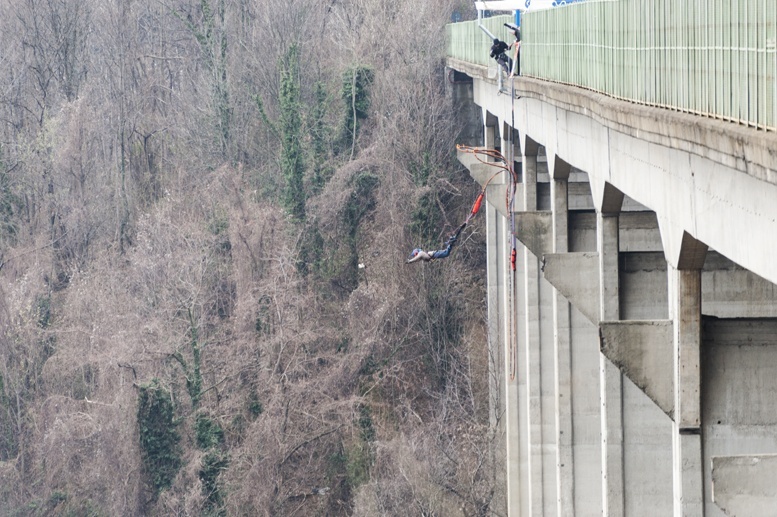 near Biella is the location of Italy’s longest-running and only permanent bungee jumping outfit. 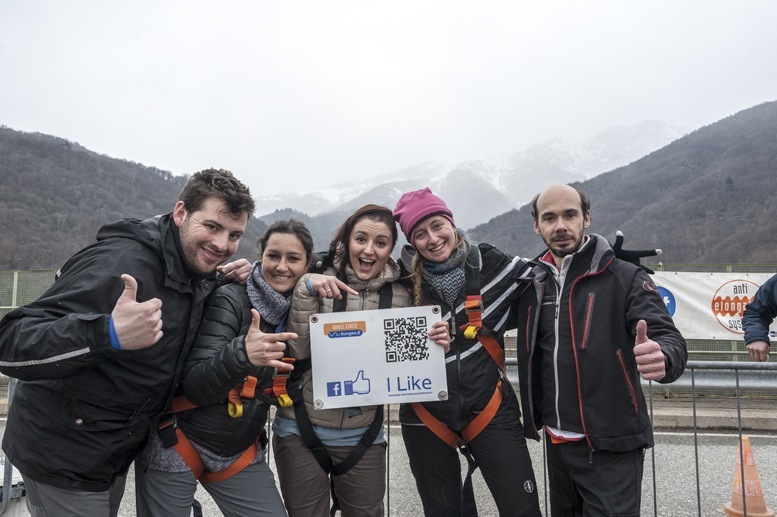 Bungee Center Veglio has been operating for twenty years, and was one of the founding members of SISE, the national safety standard for bungee jumping in Italy. Safety is paramount for these good folks. 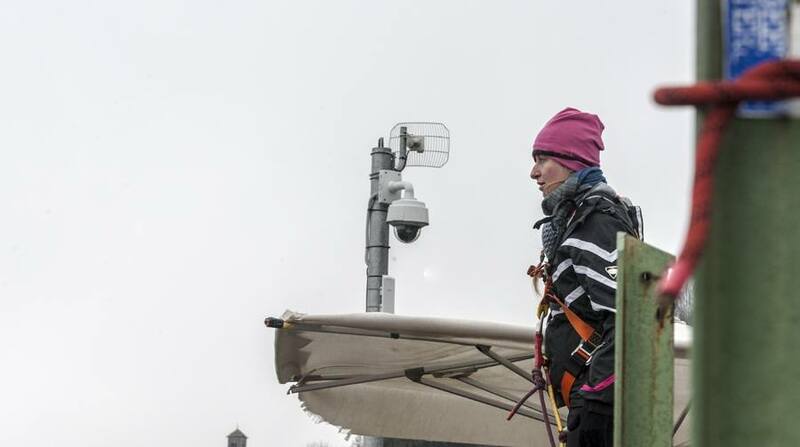 Honestly, there is nothing to worry about – there is always a team of two on the bridge, cross-checking the equipment and preparation of the ‘jumper’, and the elastic is only used for 350 jumps, despite being tested as good enough for over 1000. 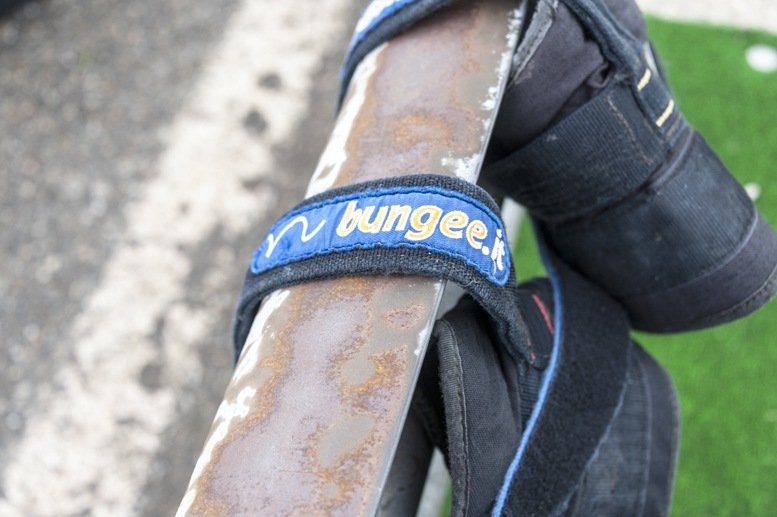 And no, the elastic does not ‘snap’ – the ins and outs of why are hard to cover in a blog post (especially if you have no engineering knowledge, like me) but rest assured, at Bungee Center Veglio you’ll be in safe hands. On the day, when we reached the location, my heart skipped a beat. The ‘Colossus’ bridge was high. 152.5 meters high to be precise – one of the highest bridges in Europe. It was a gloomy day, chilly and windy. The valley was covered in mist, and as we approached, I thought there was no way on Earth I would ever, ever make it. While I waited for my turn, my feelings were in a constant state of swinging. From happy to terrified, from thrilled to stunned. Other ‘jumpers’ waited on the bridge, patiently, for their turn. Every ten minutes or so one walked up to the three metal steps to the edge of the bridge, and then the crowd chanted …. threee, twooo, oneee … BUNGEEE! And off they leapt. I tried to prepare myself mentally to climb those steps, then gingerly spread my arms and leap, head first, as if I was jumping into the sea. But when the time came, a whirlwind of emotions overtook me. There was the first attempt, failed, as I looked down and thought no way, I want to go home, I can’t do it. Then came the pep talk that Gianluca, one of the owners, gave me. I turned my brain off. Climbed over those steps again. That’s when all the feelings disappeared. The dread, the thrill and the anxiety. I was a bird. I was lightning. I was air. I wasn’t falling, I was flying. It was a wonderful sensation of floating, of being one with the air – the feeling of having challenged my fears and my instinct, of being there between sky and earth, moving faster than I had ever moved before. Super happy, after we did it! Before I knew it, it was over. I must say, the first leap was amazing, but bouncing upside down, head first, was most certainly not. The experience left me with a headache that lasted three days – all because I was too nervous and didn’t listen to the instructions I was given on the bridge, so I ended up hanging upside down for too long. But life goes on. I leave you with this quote – stolen and translated from my dear friend Martina, creator of Pimp my Trip, one of the other two crazy ladies who jumped with me. Three lines that summarise the experience – and somehow summarise my life. We were guests of the Biella GAL and other operators mentioned in this post during this blog trip. As always, all opinions are our own. Welcome to the new Weekend Travel Inspiration Linkup! 5. 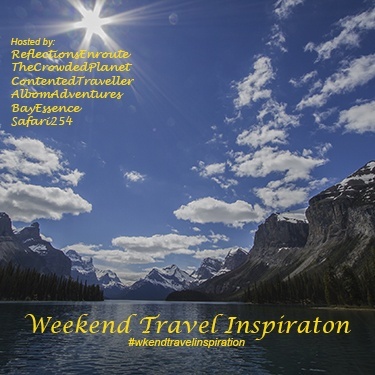 Follow all the hosts of Weekend Travel Inspiration – Corinne at Reflections Enroute, Paula at Contented Traveller, Rhonda at Albom Adventures, Rachael at Safari 254, Crystal and Francisco at Bay Essence. 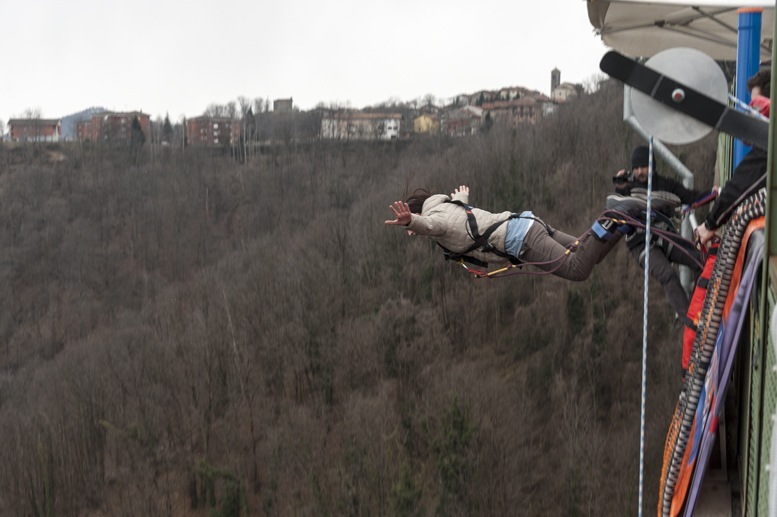 Che bell’articolo, ho una voglia di rifare bungee che proprio non ti dico, che esperienze fantastica…. dimenticavo, ehm la frase che mi hai rubato in realtà l’hai rubata a Sepulveda, frase celeberrima del libro “La gabbanella e il gatto”… magari io fossi capace di tanta poesia! Wow, Margherita, that’s amazing! You go, girl!. I’m adventurous but bungee jumping is one adventure I haven’t craved for. A little voice in me says I should go for it sometime but my rational mind says “no way.” But your experience is inspiring my little voice to get bigger and rational mind to get smaller. Maybe it’s just a matter of time and I can muster up the courage just like you did. Congratulations for conquering the fear most of us have. And thanks for the introduction to Biele. I like learning about not too touristy places. Thank you Marisol. 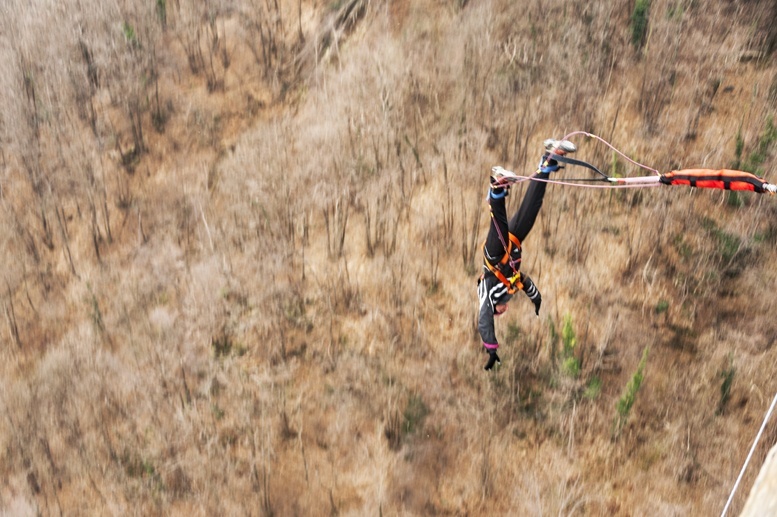 Bungee jumping is definitely worth the ‘leap of faith’… and girl, you survived the Drake Passage! So you can do it! If you saw my face while reading this post. If you saw how LONG I looked at that picture of you staring over the edge. 10 years ago I would have, but now I just don’t know. I have never gotten so dizzy reading a blog post. 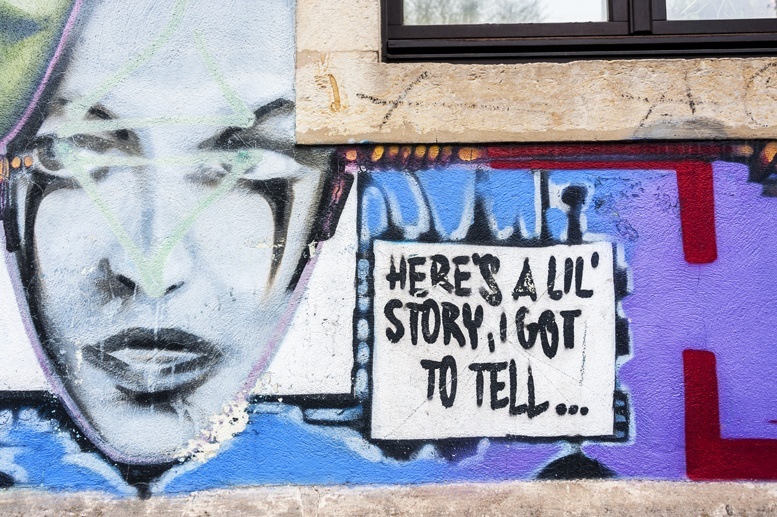 Good for you for going through with it…and at that same time….Ma, sei matta!!?? Thanks Paula! You need to come back to Italy… so many undiscovered places for you to enjoy! Thanks so much for your comment Corinne. BUUUT I’m sure you can do it too!